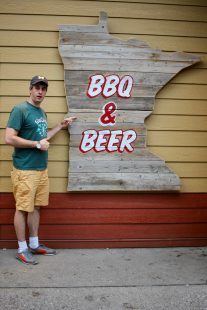 When in the Twin Cities, I almost always feel the need to get a Jucy Lucy. 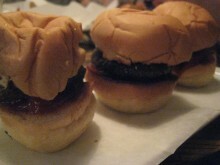 Or, I just avoid burgers entirely. Yet, on this trip my path led me to Freehouse, a microbrewery that is so incredibly popular that we had to wait longer for a table than the hostess had told us initially. Seriously. 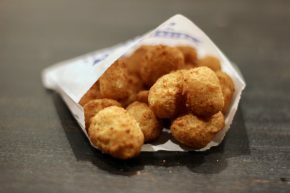 Fortunately, we were able to get things started with a couple of beers and some cheese curds before taking our seats. No trip to Canada is complete without at least one stop for poutine. Yes, even outside of the French side of Canada. The internet told me that Poutini’s in West Queen Street West had some of the best in town and I was eager to see if they could live up to the lofty expectations. Like other poutineriess, it had a few different options, but I was most intrigued by their Layered Poutine. This included an extra layer of cheese in the middle, and as much as I like bacon and other such things, this seemed best. Edit: This location is gone, but A & W still lives elsewhere. 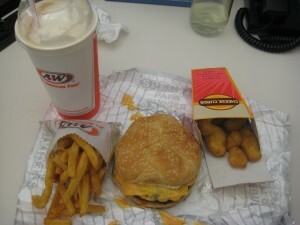 I always have fond memories of trips to A & W from when I grew up. I always loved their root beer floats and their curly fries. So when I stumbled upon an A & W in Hawthorne, I knew I had to return to relive my glory days. Unfortunately, as with so many other childhood favorites, my hopes were too high for A & W. This particular A & W was merged with Long John Silver’s, which made me sad to hearken back to the days when an A & W could have a restaurant all to itself, and not just any restaurant. These were the drive-thru sorts where you parked next to a menu and were waited on in your car. It seems those days are all but gone, and despite the generic and washed out design of this A & W/Long John Silver’s amalgamation, I hoped that the food would make up for it.